December 20. Or Akumasday, as it will be known. Akuma is basically Ryu reimagined as a big angry lion man, and after being teased for a while now, it's been revealed that he's coming to Street Fighter V in a couple of weeks. On December 20, to be exact. He's the first in SF5's second 'season' of DLC characters, the other five of whom will be "completely new" to the series. You can see their outlines at the end of the following trailer. If you've decided that you want all six of them before you know if they're any good or not, you'll be able to pick up the 2017 Character Pass on December 20, for $29.99/€29.99/£24.99. 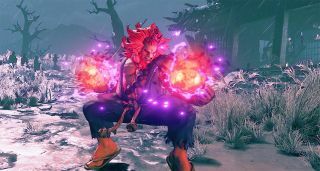 Akuma's moveset has been explained in great detail in this Capcom Unity post.